It was a new years celebration I won’t easily forget, as Cape Verde showed itself from its best and worst side. Let’s start with the good stuff. New year at Cape Verde is pretty amazing. Sure, the great weather helps, but the nicest part are the real and big smiles on the faces of the people. The setting was amazing. I had met up with a French guy, who’s writing a book and making a documentary at the same time. Both of us had dinner at the humble place of a new Nigerian friend. We decided to walk back to the city center just before midnight. Many people were out on the street and the atmosphere was buoyant. Everybody was walking the same direction as ourselves and slowly, but steadily everybody picked up their pace. It wasn’t before long until literally everybody started running down the hill towards the harbor. The reason was immediately clear when we arrived: everybody and their brother was out there. It seemed like literally the whole population of the island had united on the small boulevard. People jumping in the ocean, (but this isn’t as brave as doing the same in The Netherlands). I’ve rarely seen people so delighted at a fireworks display, nearly every explosion was met with joyful cheers. Everybody was having a great time and the happy party in the street continued into the early hours. I woke up early for unexplainable reasons. After taking a quick shower I heard the drums and other instruments in the distance. 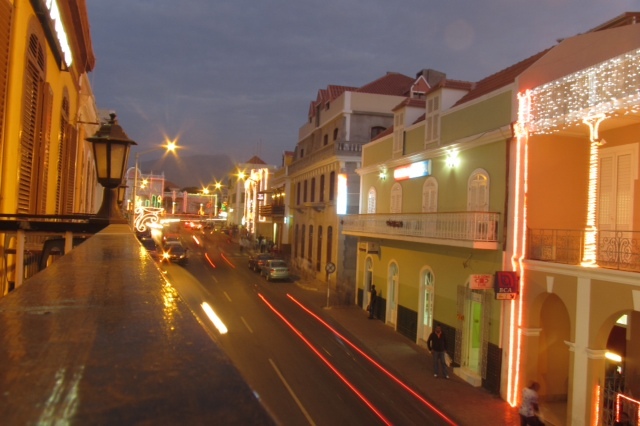 I decided to head out onto Mindelo’s streets, deserted like they should be during an early morning after a new years eve celebration. I had no difficulties locating the music. It was a marching band followed by a small group of around 60 people who all were dancing to the same 15 second repeating sound. As (again) everybody was happy and smiling, I decided to join them (except for the dancing, as I didn’t want to make a fool out of myself). Slowly the size of the group increased, but we were never mo than a hundred. I ran into some locals and time passed quickly and happily. After we had been walking around for a couple of hours (still to the tune of the same 15 second music loop) we ended up at a big fence. I asked what it was and my friends quickly pointed out that it was the local hospital. We marched onto the terrain for a truly amazing spectacle. The drums and other instruments started playing louder and louder and everybody really was giving their best. Slowly, but steadily, tired faces started appearing in front of the hospital windows. The nurses came out and the crowd waved at the ill people. Smiles appeared on their faces and some of the patients even managed to squeeze out a couple of dance moves, which motivated our crowd to give even more. When we left the terrain, I asked one of my friends to explain the spectacle. She told me that it is a tradition to come the hospital and to dance for the ill people. “We know they can’t be with us now, but through our music and dancing we show our desire and hope that they can be dancing with us again next year.” Happy shivers down my spine. Little did I know, that I would return very soon to the hospital. 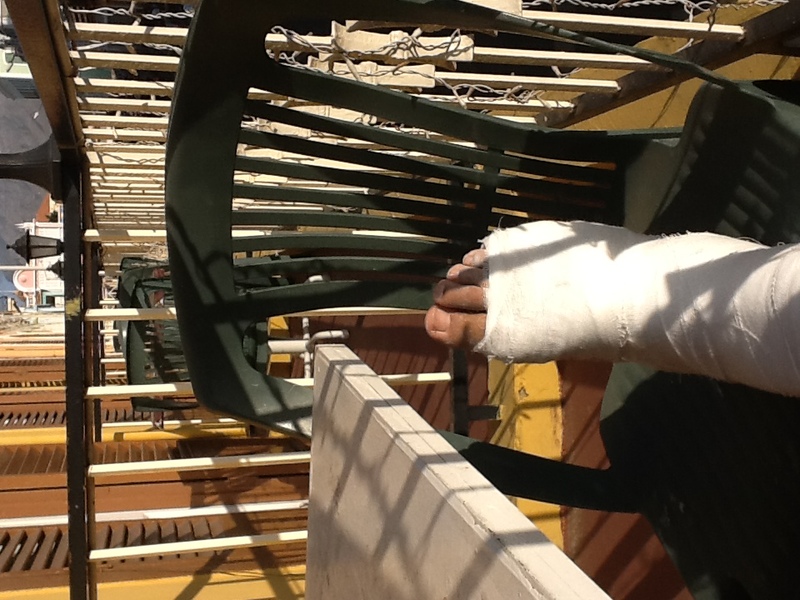 Every day seems to be a party day in Cape Verde, but New Year really is a two day party here. For the second night I met up with a couple of Capeverdian friends and before I knew it, I was the only white guy at a 1.500 people party. Great people, great music and when they discovered I was Dutch I had to listen to many a story about uncles in Rotterdam, dreams about moving to The Netherlands and the eternal friendship between people of Cape Verde and The Netherlands. Despite my “traveler reputation” I’m really not used to wild celebrations anymore, so I decided to head home early. Outside the gates taxis were stormed by groups of people eager to catch a ride home. I was watching the spectacle with a smile, which quickly disappeared when I noticed I had missed out on a car driving up behind me. To late, and the car drove over my right foot. I went down to the ground screaming in pain. I noticed people walking up to me. Instead of helping me up, they sat on top of me and grabbed my mobile phone from my trousers. Shouting and screaming, I managed to get away. Unfortunately not for far. A guy walked up behind me as I was struggling to walk and pushed / punched me down to the ground. I felt my wallet being taken from my other pocket. They ran of. As the robbers had taken my room keys as well and the spare keys were locked away, I had to sleep on a chair in the lobby. The following morning I headed out to the hospital. 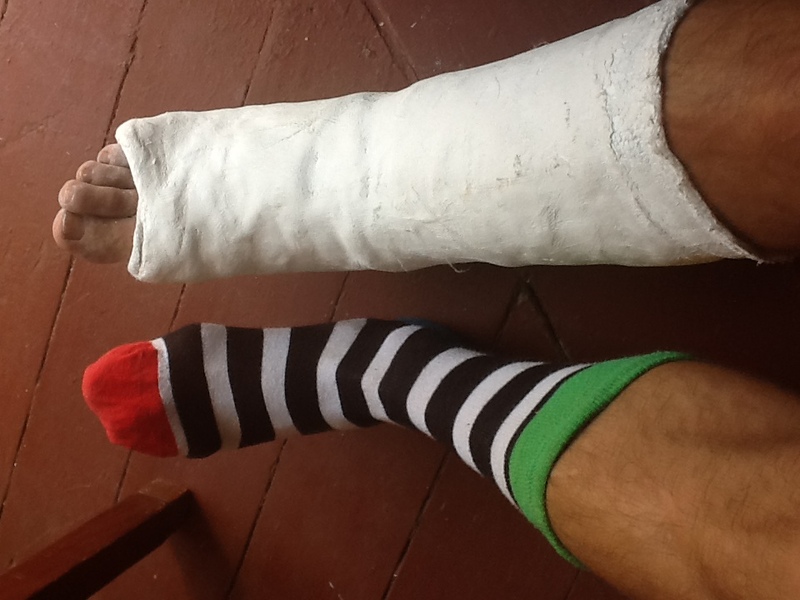 The diagnosis was unambiguous: a broken foot/ankle, 4 weeks plaster. I was devastated: I don’t have four weeks! For one of the very few times during this trip I had a deadline. Reason being that the season for crossing the Atlantic by sailing yachts is coming to an end. And no way that I can cross the ocean with a broken ankle. After the initial depression, I decided to make the most out of it. Learn some Portuguese, do a programming course, and work a bit on my website project. Today I moved out from the hotel to an appartment. By gcjbos in Uncategorized on 14/01/2012 . Sorry to hear about the robbery. I went to Cape Verde (6 islands in 1994 and 2006 excluding Mao, Brava and Boa Vista). The complete opposite happened to me. I left my credit card in a machine and someone chased me with it in Mindelo. I’ve heard things are bad now in Sal probably because I’ve been told the big hotels don’t employ the locals. Shame you don’t have any photo’s posted of the celebrations. I would love to go back but I have a 4 year old so can’t afford to go.